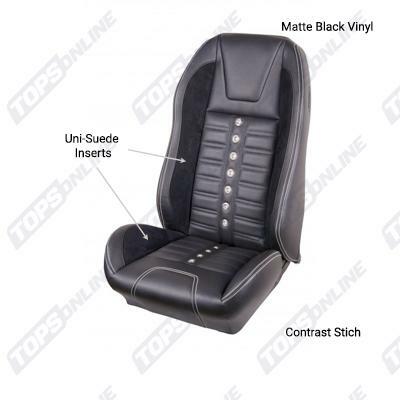 The replacement seat covers offered on this page are for the Ford Mustang with Hi-back bucket seats for the 1972-1973 model years. They are manufactured by TMI Products and come in several upholstery choices; sport seat upholstery is also offered on this page. 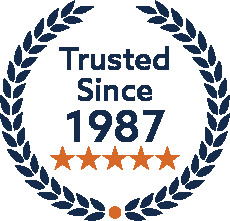 TMI Products include a limited lifetime warranty; TMI cloth products include a 1-year warranty. These replacement Deluxe Hi-Back bucket seat covers are for the 1972-1973 Ford Mustang Convertible, Coupe and Sportsroof body styles. 1972-1973 Ford Mustangs were available with both Standard Seats and Deluxe Seats; Deluxe Upholstery was an upgrade from the factory which included special accents such as chrome trim. These Deluxe Seat Covers will fit both Standard and Deluxe seat frames. Manufactured to factory specifications and workmanship. TMI Products set standards above OEM, so you will get the highest quality seats. Upholstery for these Deluxe Seat Covers is an exact factory reproduction - exactly like factory original, down to the stitch count. This set of replacement seat covers does not include the plastic shell which goes on the back of the front bucket seats. That must be purchased separately. Front seats are the same for all body styles. These Factory Style Deluxe replacement seat covers are for the Ford Mustang with hi-back bucket seats, and are available in a Front and Rear set, or Front Only. Deluxe Upholstery was offered by the factory in 2 distinct styles, Vinyl or Grande Cloth. This is the Vinyl style, and it is made with Corinthian Grain Vinyl Trim with Comfortweave Inserts. You may purchase the Grande Cloth style below. Front and Rear sets include a total of 6 pieces: 2 front seat bottoms, 2 front seat backs, 1 rear seat bottom and 1 rear seat back. Front Only sets include a total of 4 pieces: 2 front seat bottoms and 2 front seat backs. Front seats are the same for all body styles and can be purchased separately as well, you can order them separately below. These Factory Style deluxe replacement covers are the Full Set (Front and Rear), or Front Only, for the Ford Mustang with hi-back bucket seats. Deluxe Upholstery was offered by the factory in 2 distinct styles, Vinyl or Grande Cloth. This is the Grande Cloth style, and this style is made with Corinthian Grain Vinyl Trim with Houndstooth or Tweed Cloth Inserts. The Full Set (Front and Rear) includes a total of 6 pieces: 2 front seat bottoms, 2 front seat backs, 1 rear seat bottom and 1 rear seat back. The Front Only Set includes a total of 4 pieces: 2 front seat bottoms and 2 front seat backs. 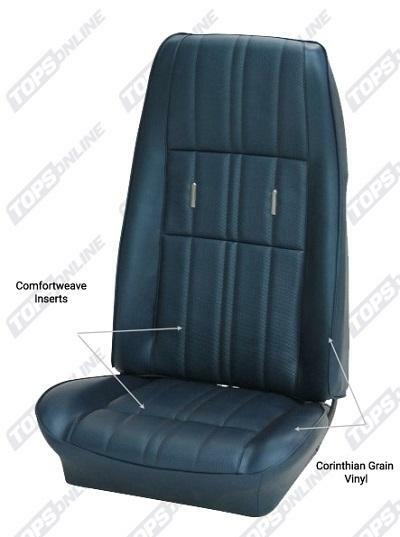 These Deluxe replacement Full Set (Front and Rear) or Front Only Sport Seat covers are for the 1972-1973 Ford Mustang (Coupe, Convertible, and Sportsroof models) with Hi-Back bucket seats. 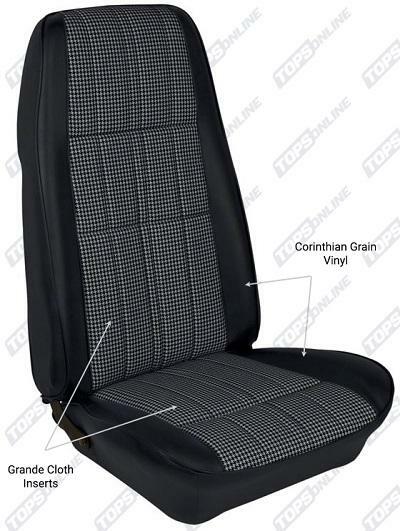 This Deluxe Sport Seat Upholstery is made with Corinthian Grain Vinyl Trim with Comfortweave Grain Inserts. Although this is an aftermarket upgrade, this upholstery fits on the factory frame and uses the factory attachment points. New Sport Seat foam is required for a proper fit on the front bucket seats and to provide increased side and leg bolsters. These replacement Vinyl Sport R500 Seat Covers are the Full Set (Front and Rear), or Front Only, for the Ford Mustang Coupe, Convertible and Fastback models. It is upholstery used to transform factory seats into the Sport R500, modern and aggressive style seats. 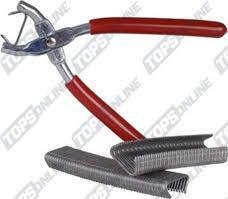 These will fit your factory original seat frames whether you are replacing standard or deluxe upholstery. Two New Sport Seat foams are required (one for each front seat) for a proper fit on the front bucket seats; these will fit over the seat frame and headrest, and provide increased side and leg bolsters. R500 upholstery sets have the Bolsters, Back and Sides in your choice of OE Black Vinyl, which is Black Sierra Grain Vinyl (slight sheen to vinyl), or Premium Black Vinyl (matte finish to vinyl). Both options feature High-Quality UniSuede Inserts. It also has the running Rally Stripes and Contrast Stitching throughout in a variety of colors. 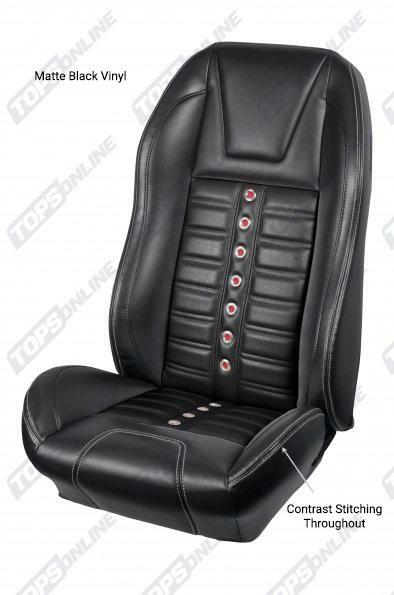 Bring the interior of your Mustang up a notch with these Sport R500 Hi-Back Seats! These replacement Vinyl Sport X Hi-Back Seat Covers are the Full Set (Front and Rear), or Front Only, for the Ford Mustang Coupe, Convertible and 2+2 Fastback models. It is an upholstery set used to transform factory seats into the Sport X Hi-Back Style Seats. Two New Sport Seat foams are required (one for each front seat) for a proper fit on the front bucket seats; these will fit over the seat frame and headrest, and provide increased side and leg bolsters. 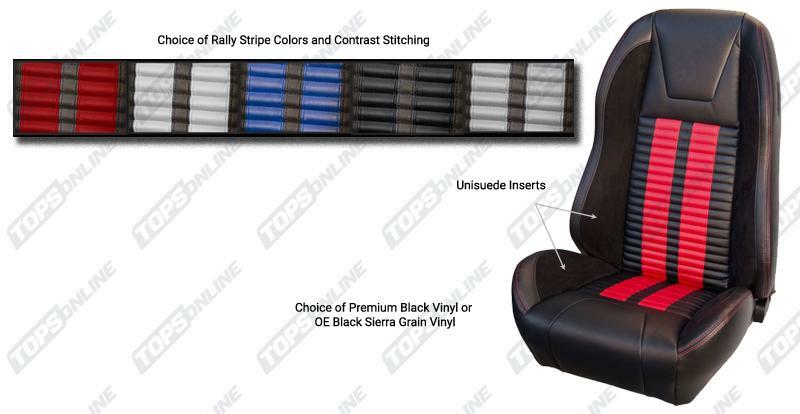 These Sport X upholstery sets have Vinyl Bolsters with Matte Black Vinyl back and sides. It also has Contrast Stitching throughout & the color seen behind the grommets matches the contrast stitching. The grommets are available in stainless steel, brass or satin black. These are Sport X Seat Covers, not to be confused with Sport XR. The Sport XR series differs from the Sport X because the XR Seats have Uni Suede inserts in the bolsters. These Sport X Seat Covers do not have UniSuede Inserts. These replacement Vinyl Sport XR Hi-Back Seat Covers are the Full Set (Front and Rear), or Front Only, for the Ford Mustang Coupe, Convertible and 2+2 Fastback models. It is an upholstery set used to transform factory seats into the Sport XR Hi-Back Style Seats. Two New Sport Seat foams are required (one for each front seat) for a proper fit on the front bucket seats; these will fit over the seat frame and headrest, and provide increased side and leg bolsters. These Sport XR upholstery sets have Premium Black Vinyl Bolsters, Back, and Sides, and Uni-Suede inserts in the Bolsters. It also has Contrast Stitching throughout & the color seen behind the grommets matches the contrast stitching. The grommets are available in stainless steel, brass or satin black. These Sport XR Seat Covers should not be confused with the Sport X series. The Sport X series differ from the Sport XR because the Sport X Seats do not have Uni-Suede inserts in the bolsters. These Sport XR Seat Covers have Uni-Suede Inserts.